Is there CrossFit after 60? Hilary Achauer investigates at the 2011 Reebok CrossFit Games. Some couples celebrate their anniversary by going on a cruise to Alaska. Some throw a party. 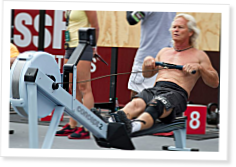 High-school sweethearts Greg (62) and Becky Walker (60) commemorated their 41 years of marriage by competing together in the 60-Plus Masters Division at the CrossFit Games. Does experience count for anything at the CrossFit Games? Hilary Achauer explores how rookies Jenny LaBaw and Brick CrossFit came out of nowhere and stormed their way into the top 10. In our mid 60s my wife and I have been doing CrossFit at CrossFit DoJo in Chamblee, Georgia, for three months and are already seeing significant results with committment growing with each workout. This article let us know that there are others in CrossFit who think like us and are excited about getting off of it and getting on with it. Thanks much for the article, I hope to see more articles and yes, we look forward to meeting each of you in time at the games. I first met Greg as just a name by checking the leader board during the sectionals. I took note on how strong he finished the last four workouts. I met him in person while driving with my son en route to Ft Sam Houston from So.Cal. We stopped in at CFNWTuscon for our WOD. Not only did we meet a first class athlete, but a first class person. I also got to meet his daughter on that trip who showed that as an athlete, coach and person she was also first class. At the Games my wife and I met Becky and Greg and discussed what a wonderful couple they were. Congratulations on 41 years and your phenomenal achievement and example to your family and others. My 30 year high school reunion is next year, 2012. It just hit me because after 3+ years of CrossFitting, I don't feel my age at all! THANK YOU CROSSFIT!! So glad to be a part of this global community. In my mid-30s, and looking forward to doing this for DECADES more. The individuals competition is amazing, the Kids program is what I want to dedicate my life to, but the master's athletes are by far the most inspirational people on the planet. Awesomeness abounds! Congratulations Greg and Becky. It was a pleasure meeting and competing with, or rather, behind, you, Greg. And I especially want to mention how impressed I was with your outgoing, charming granddaughters. Your family and their support was wonderful to see. Hope to see you again next year! I had no clue I was training and being taught by a leader! Thank you for all you have done Greg and Becky this is such a great article! I had the pleasure of judging events for both Greg and Becky at the 2011 games. I just wanted to relay a hearty congratulations and say how enspiring it was to watch each of you compete.